The AP reports on the rising GPS crime wave. With GPS units falling to a price where many cars have them, it’s led to an easy target for criminals looking to make off with a quick $100-$200. LARCENY FROM AUTO (SERIES) 06/24/07, 800 block of S. Army Navy Dr. Between 0945 hrs and 1905 hrs on 06/24/07, someone broke into five vehicles in a parking garage. Portable GPS systems were taken from four of the vehicles and a duffel bag containing various items was taken from the other. 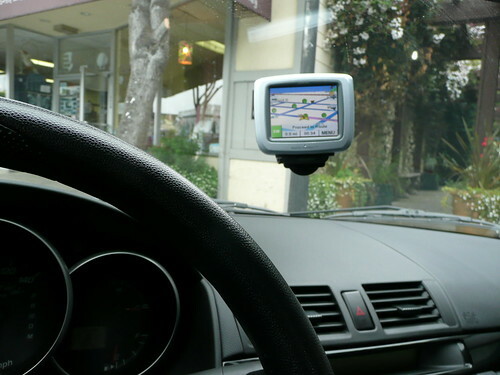 Beyond losing the GPS, you also have to deal with the cost and hassle of replacing a broken window. That’s one clear advantage of factory installed GPS units: they’re harder to take. And if they’re taken, they’re usually covered by insurance, while portable units are not. But that’s probably not worth paying 10x as much. What’s likely to end this crime spree? My guess is that it’ll only end when GPS units get so cheap and ubiquitous that they’re not worth stealing. This entry was posted in fun, gps, satellite navigation. Bookmark the permalink. It’s really worth the small time and effort it takes to put away your GPS before leaving your vehicle, for sure! Having to replace both your windshield and GPS is way more time consuming,not to mention spendy.